I took the liberty of showing the sketchwork (to exhibited in this year's Design, Drink and Be Merry show) that goes with the finished label. Anything by Polacheck is going to be bold, colorful and fun. I love the inclusion of background art in particular in this effort. 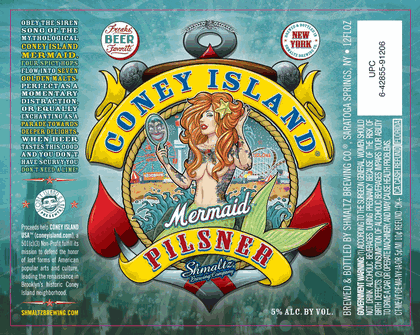 The Coney Island behind the mermaid, the underwater look on the label itself, even the crazy Coney Island Lager face in the mirror; the "Where's Waldo" effect of the details make this one of those pieces you want to keep looking at and finding new things.